In just one week, real estate professionals from across the globe will be descending upon San Francisco to attend Real Estate Connect July 10-12! From CEOs to thought leaders to innovators of technology, the best and brightest will be here. 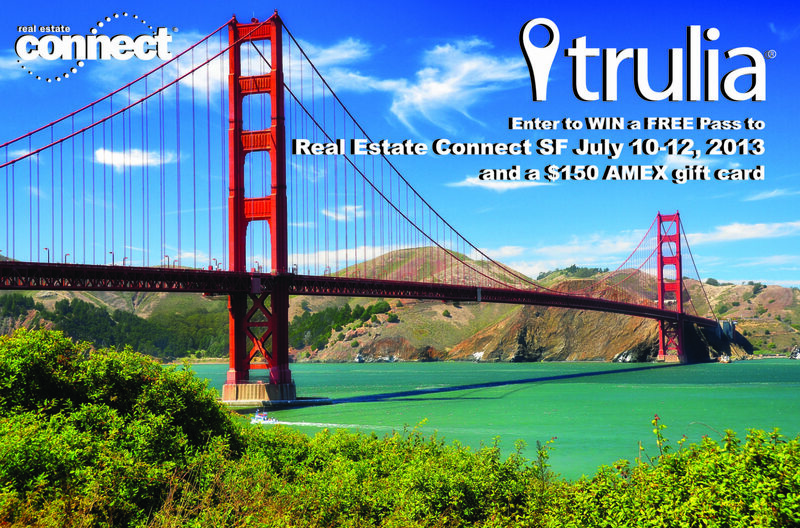 As a Platinum sponsor of Connect, Trulia would like to offer one of our lucky InmanNext readers a free pass to Connect AND a $150 AMEX Gift Card to spend having some extra fun. Enter to win today below, and the lucky winner will be drawn on Monday, July 8! Head to the Hilton Union Square on Tuesday, July 9, and you will pick up your pass and gift at registration! A full-access conference pass* to Real Estate Connect 2013, July 10-12, in San Francisco. A pass to Agent Reboot, July 9, in San Francisco. One AMEX Gift Card in the amount of $150. Thank you to Trulia for partnering with us at Real Estate Connect! We look forward to meeting our lucky winner, and to seeing you all at Connect!